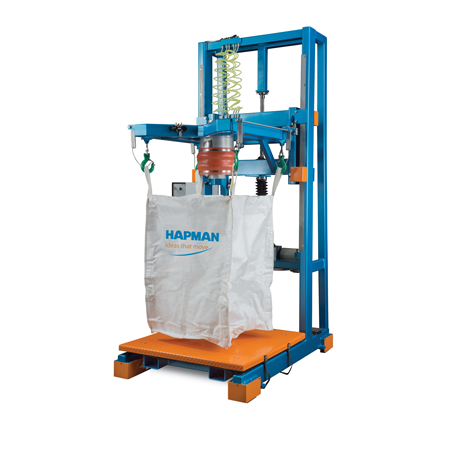 Hapman’s bulk bag filling machines handle various bag sizes up to 4,000 lbs (1,814 kg). Engineered, dust-tight bladder filling mechanism on both the NT Series and Heavy-Duty Series bag filling machines for maximum dust control. Cantilevered, heavy-gauge steel tubing frame with adjustable or fixed height for unrestricted bag access from three sides. Forklift pockets for easy movement. 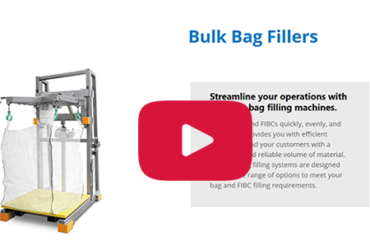 Fill bags & FIBCs quickly, evenly, and efficiently. Keep operations effective and your customers happy with consistent & reliable volume of material with Hapman Bulk Bag Filling systems. The NT Series offers sturdy arms for looped bag handles that can be easily hung, while the bag filling machines in our Heavy-Duty Series are designed with sliding hooks for quick loading of empty bags and safe unloading of full bags. Both models come with Hapman’s exclusive inflatable bladder design for a dust-tight seal during the bulk bag filling process. Bulk bag filling systems are fed either directly from equipment or from a feed conveyor. The empty bag is placed on the secure arms (NT Series) or on the lift hooks (Heavy-Duty Series) of the bag filling machines. The bag spout is placed over the bladder. The filling button is activated to begin the filling of the bladder. Once the bag is securely in place, material can begin to flow into the bag. When the bag is full, the release button is pressed, allowing the bladder to deflate. The filled bag can then be removed from the filling station. The fill head is designed to help remove the displaced air and dust from the filling process. This provides you with a dust-free filling operation. Through the use of the optional load cells and batching controls the filling system can provide you with precise feedback as to the exact weights within the bag. Each Filler is designed and manufactured to meet your specific needs, utilizing numerous standard options and features. While being ergonomically designed for easy bag access, the Bulk Bag Filler offers very few components that require maintenance. Redesigned quick-release safety hooks offer a single switch lever to quickly and safety release a filled bag. Tote or drum filling adapter for accurate FIBC filling. Vibration table fills bags more completely (see video below). Load cells deliver precise bulk bag filling results (see image below). Roller conveyor increases productivity for continuous applications. Bag pre-inflator and deaerator maximizes bag capacity and improves filled bag stackability. Motorized height adjustment safeguards operators (see image below). Traversing and quick-releasing rear hook assemblies increase operator safety (see video below). Hang weighing system fills bags more precisely and requires no recalibration when moved to different locations (see image below). Batch weigh control systems available. Stainless steel or carbon steel.